Practice your best zombie scowls, Spokane. 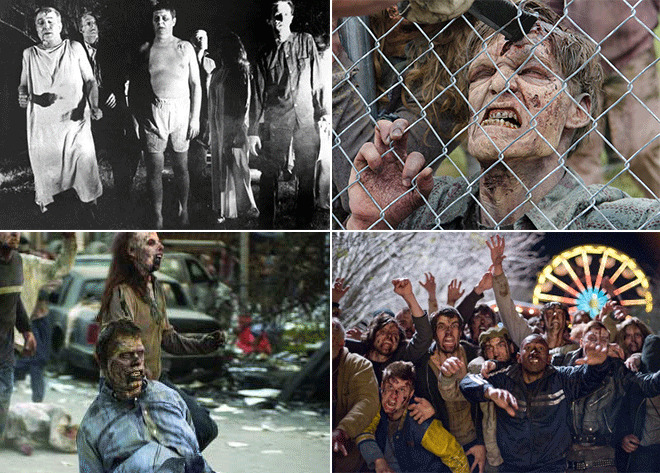 Some inspiration from (clockwise from top left) Night of the Living Dead, The Walking Dead, Zombieland and Dawn of the Dead. This week SyFy announced it ordered a new zombie TV show called Z Nation — and it’s going to be filmed here in Spokane. Big Fish NW Talent is looking for hundreds of Spokane-area extras for the 13 episodes, and they’re casting for a “variety of sizes, shapes & colors.” Those who are interested should register with them here. “Z Nation will take viewers where no zombie has gone before,” showrunner Karl Schaefer said in the show announcement. The show begins three years after a zombie virus swept the nation, with a team of heroes attempting to transport the only known virus survivor across the country to develop a vaccine from his blood. They’re traveling from New York to California, with Spokane presumably standing in for the “three thousand miles of rusted-out post-apocalyptic America” they must traverse. Z Nation is expected to debut this fall. UPDATE: Those who'd like to be extras should register with one of three local agencies: Big Fish NW (mentioned above), Flannel Background (register here) or The View Talent Agency.